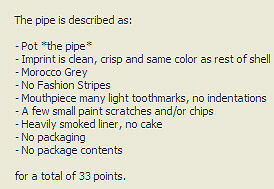 The value of pipe #742 is 33 points. From the description and photo by Rae Clare (clarestimeandagain) on eBay it was impossible to tell which grey this pipe is and experience has shown that asking eBay sellers about colors leads nowhere. So I took a chance that it would be an improved example of the Ash Grey Pot. It isn't and, although just about as good, it is not an improvement for the Morocco Grey already in the collection. So I must bite the bullet and sell it. My loss is your gain. George Sackett became another fan of these easy to clean and great smoking pipes and bought this one for his rotation.